Pan Seared Tuna Steak with Olive Relish is a quick, healthy meal you can have on the table in about fifteen minutes. 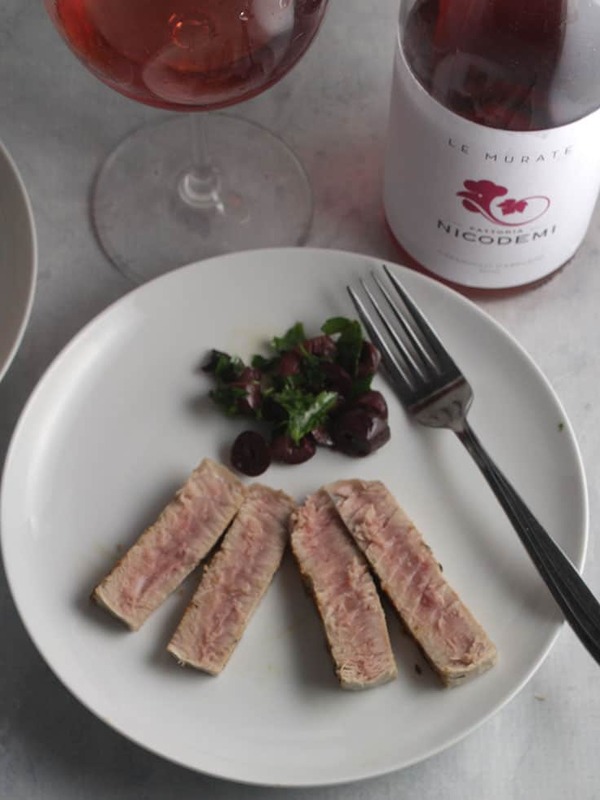 We enjoyed the tuna paired with a Cerasualo rosé wine from Abruzzo. Looking for an easy tuna steak recipe? You’ve got it! Our Pan Seared Tuna Steak with Olive Relish can be on the table in 15 minutes, no exaggeration! We use a simple rub of garlic, thyme and salt to give the fish a nice flavor. Topped off with an easy olive relish and you’ve got a restaurant quality Mediterranean style meal on the table faster than you can order takeout. Oh yes, and of course pan seared tuna steak is a healthy meal packed with lean protein and omega 3 oils. You can certainly pick up some fresh tuna steak to make this recipe. But more often, when I’m making pan seared tuna steak, I use frozen tuna steak from Whole Foods. Frozen tuna is a nice option to have on hand for quick healthy meal. I thaw the frozen tuna steak by putting the inner bag containing the tuna into a large bowl of warm water. It takes about 30 minutes to be ready to cook this way. Be sure to check regularly as you don’t want the thawed tuna to sitting out at room temperature too long. You can also plan ahead and put the frozen tuna in the fridge to thaw overnight. Once you have the tuna ready to cook, rinse and pat the tuna steaks dry. Sprinkle the seasoning on the tuna and let it sit for a few minutes as you make the olive relish. How long do you sear tuna steaks? Not very long at all if you want to have flavorful fish! I time it at 90 seconds per side on medium high heat, for 3 minutes total cooking time. That timing yields a nice medium rare tuna, seared on the outside and a deep reddish purple on the inside. I got distracted and went a bit over my cooking time when making the Pan Seared Tuna with Olive Relish for these photos. The tuna in the Asian Tuna Noodle Bowls shown above is cooked more to my liking. 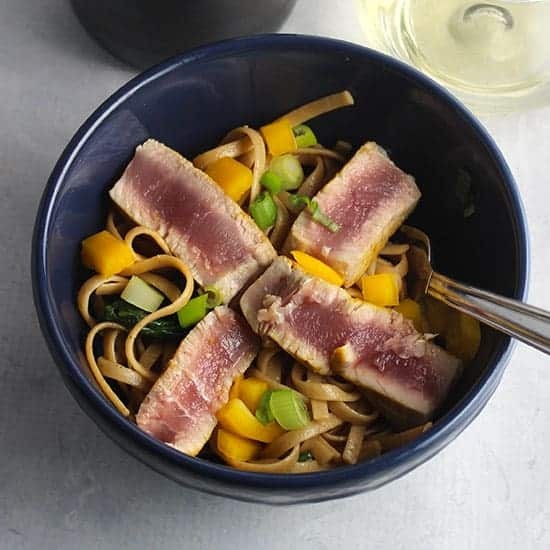 Tuna is a meaty fish that certainly dispels the notion some people have that fish needs to be paired with white wine. 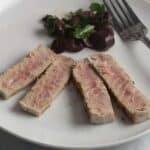 We enjoyed a similar pan seared tuna recipe awhile back with a big Merlot, and it worked great, showing that red wine and tuna can work. But thinking about the Mediterranean flavors of this dish from the olive relish, not to mention the summer heat, I was thinking a full bodied rosé would be the wine to choose. After my recent visit to Abruzzo, I knew just the rosé to fit the bill! 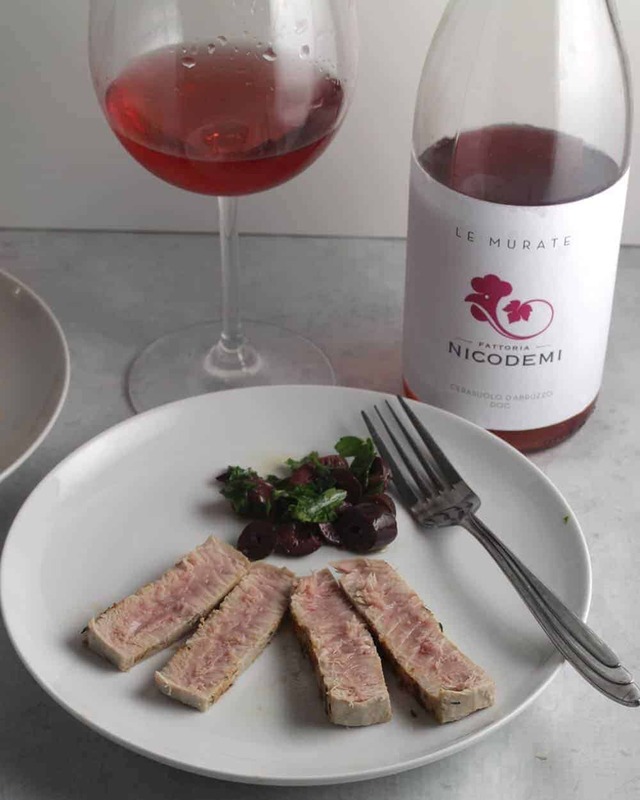 I opened the 2017 Le Murate Cerasualo d’Abruzzo ($15)from Fattoria Nicodemi to go with our pan seared tuna steak. Cerasaulo is a full-bodied rosé made from Montepulciano grapes. The Cerasualo from Nicodemi is a good expression of this type of wine. Bright floral nose, with cherry fruit and a hint of citrus. A well-structured wine, with more substance than most rosés. The body and flavor profile made it a great pairing for the tuna steak! Nicodemi was the first winery I visited on a press trip to Abruzzo this spring. Brother and sister Elena and Alessandro have done a great job building on tradition at this family winery while growing their business. The winery is 300 meters above sea level and about 10 kilometers from the Adriatic Sea, with views of the Gran Sasso Mountain on clear morning. They make wines using organic methods, producing some 200,000 bottles per year. Learn more about the winery at the Nicodemi website. Simple pan seared tuna steak topped with an easy olive relish for a quick, healthy meal. Make the rub: combine the garlic, thyme and salt in a small bowl. Rinse and pat dry the tuna steaks. Sprinkle enough of the rub on one side of the tuna to coat, and gently rub it into the fish. Turn the tuna over and repeat on the other side. Make the olive relish: Combine the olives, olive oil, lemon juice and parsley in a small bowl. Set aside. Coat a a nonstick skillet with oil spray on medium high heat. When it is hot, add the tuna and cook for 90 seconds on one side. Turn and sear on 90 seconds on the others side. Remove from heat. Plate the tuna steaks, and top with the olive relish. Enjoy with a full bodied rosé wine if you are so inclined. « Exploring Abruzzo Wine: An Italian Wine Region to Know!